» Making the armor. How they did it in the Middle Ages? Making the armor. How they did it in the Middle Ages? There’s no so much information about specific technologies of plate armor craftsmanship. But still we have different sources of that time such as Illuminated manuscripts, medieval illustrations where we can see a craftsman doing his work, descriptions of specific forging tools . According to those historical sources there was a structure in work organization of blacksmiths and other forge workers. Each of them was engaged in certain part of armor manufacturing. There’s one very interesting manuscript: a list of German blacksmiths who worked in Greenwich in XVI century. We can read there that different craftsmen did different work: some of them was forging out the steel plates forming the shape of armors, polishers did only finishing work of polishing, locksmiths did buckles and loops installing them on armors. 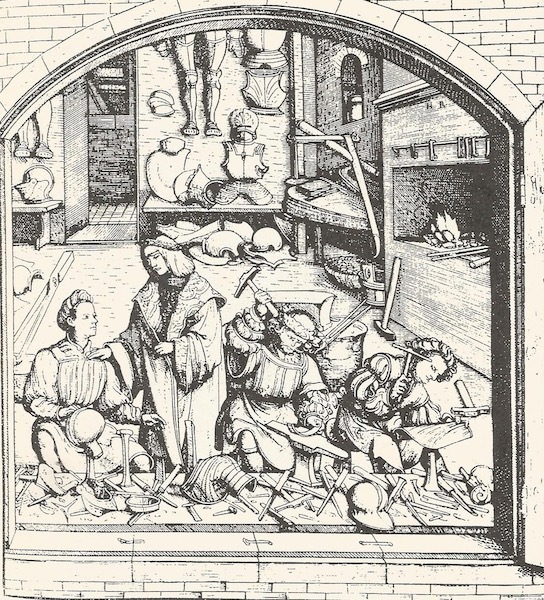 Milanese blacksmiths, who was well known worldwide because of their milanese armor, in XV century had even more dipper division of work on a specialty. One craftsman was making only one or few armor parts which supposed to become a completed armor. Moreover many workshops had its own specialists of engraving, incrustation and gilding. Until XVII century steel plates were made from metal blocks mostly. Blacksmiths used a special hummer which were moved by the help of power of water mechanism. Rare they were using hand hummer. According to one of historical sources, approximately in 1500 year in Germany craftsmen were using a special metal roller. At least this method of steel sheets making became really popular all over the Europe. Steel sheets had to be cut according to patterns of armor parts: steel legs, steel arms, spaulders, greaves, sabatons,cuirass, helmets. Then blacksmith started to make a shape with the help of special steel form templates. They looked like many different anvils fixed vertically. Cold forging was used to get a basic shape of armor. But some parts such as curved edges or “ribs” could be done only by heating and tempering. After all steel elmets of future armor got shaped, forged and hardened – the next step is coming. The most difficult: gathering all parts thogether and adjusting them to fit. This was very important process, since completed armor should have no gaps, should be comfortable to wear, movable, articulated. And what was really essential for the Middle Ages knight – his armors should protect him as much as it possible during the numerical medieval wars. Adjustment of armor is completed, what next? Polishing, polishing, polishing. Polisher used not only his own hands for this but also a special mechanism. It was a kind of abrasive wheels moved by water. In case if armor had to be decorated with engraving or incrustation – it went to the engraver’s hands. Jewellers also had a part if customer was really rich and noble. The last few steps left before armor is battle ( or maybe parade?) ready. At the end of armor manufacturing the locksmith had to attached all buckles, loops and fastenings. Very often armor had a linen covering from the inner side. Completed armor was proudly “signed” by the mark of craftsman. 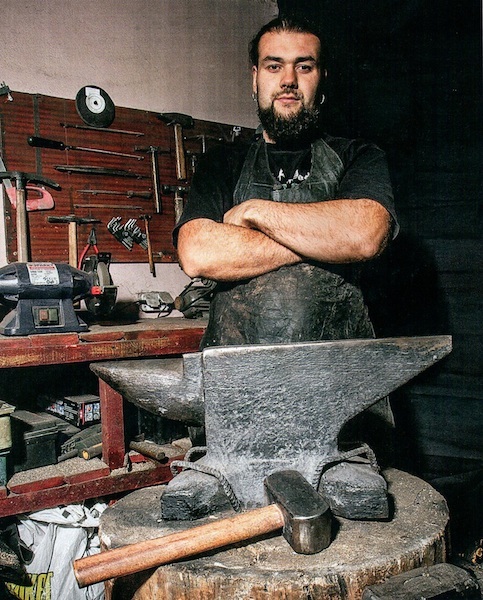 Nowadays modern blacksmiths use some techniques of medieval blacksmith craftsmanship. But producing the HMB and IMCF armor is not only about medieval tips but it’s also a knowledge of basic electric tools work. Battle of the Nations or WMFC requires a hight top quality armor. Both historicity of armor and it’s protective qualities should supplement each other. In our workshop you can choose tempered steel armor, titanium armor and padded stuff to start the medieval full contact fight.